We evaluated five VPN routers suitable for small businesses from Cisco, D-Link, DrayTek, Mikrotik and ZyXEL based on price, features and user friendliness. 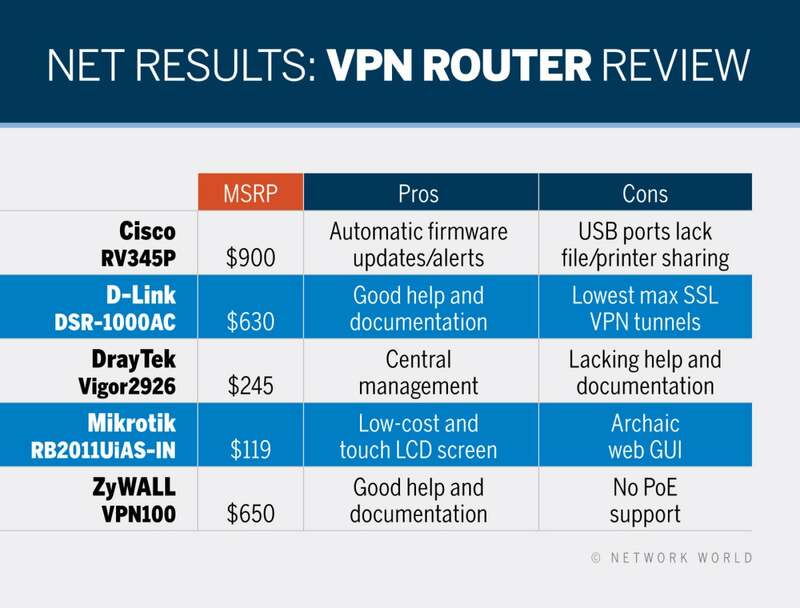 When selecting VPN routers, small businesses want ones that support the VPN protocols they desire as well as ones that fit their budgets, are easy to use and have good documentation. We looked at five different models from five different vendors: Cisco, D-Link, and DrayTek, Mikrotik and ZyXEL. Our evaluation called for setting up each unit and weighing the relative merits of their price, features and user-friendliness. All the units we reviewed support IPSec, SSL, and L2TP VPNs. All support PPTP VPNs, except ZyXEL. If you’re looking for a wider variety of VPN options, consider D-Link or Mikrotik, both of which also support OpenVPN. Here are the individual reviews. The Cisco RV345P has a manufacturer’s suggested retail price of $599 but sells online in the $350-$400 range. In addition to the typical routing and VPN functions, this unit has support for content filtering, which requires a separate license. On the front of the unit you’ll find LED lights for the power, VPN, DMZ, USB ports and diagnostics. There’s one USB 2.0 port on the front for connecting drives, configuration, storage and 3G/4G modems for WAN failover. You’ll find two Ethernet WAN ports, which support load balancing and failover. 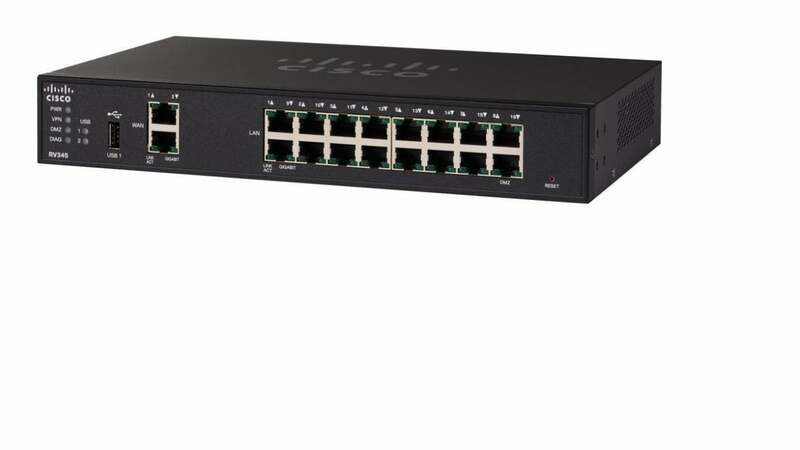 There’s 16 Ethernet ports for LAN/DMZ connections, with PoE supporting up to 30W per port, which is enough to power 802.11ac Wave 2 access points. Lastly, there’s a hole for the reset button on the front as well. On the left side of the unit is another USB 2.0 port for connecting a drive or cellular WAN connection. Unfortunately, none of the USB ports on this unit allow you to plug in a drive or printer for sharing on the network. On the back of the unit is the AC power input, power button and an Ethernet port for the console access. Along with the router, you receive an AC power adapter, Ethernet cable, Ethernet-to-serial console cable, mounting brackets and a quick-start guide. The unit also comes with a registration guide, which you need to follow in order to activate the security/filtering features. We evaluated this Cisco unit with the firmware version 1.0.01.18. After logging into the web GUI, you see the Getting Started page with shortcuts to setup wizards, various settings and stats. You’ll find the typical Cisco web GUI with the categorized navigation menu on the left side of the page with sub-menus that expand. The Status and Statistics menu gives you pages to see details on the TCP/IP services, ports, QoS, applications, routing and other network and system components. In the Administration menu you’ll find the general system- and file-management settings, including those for licenses and certificates. The System Configuration menu contains more general system settings, like the typical hostname, time and logging and alert configuration. We also found an automatic update feature, which not all routers support. It can conveniently email you when the router firmware, USB modem or security signatures have an update available. 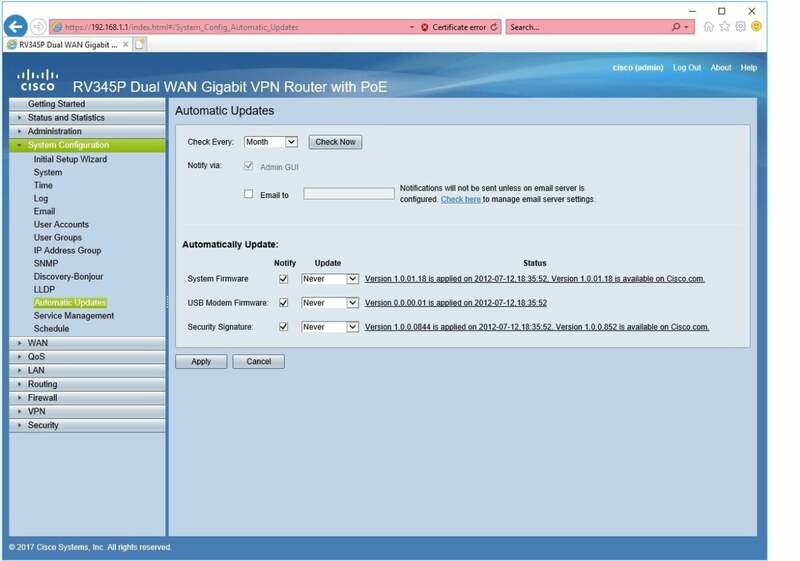 In the WAN menu are the typical Internet connection settings, including the WAN balancing/fail-over configuration with mobile 3G/4G support and the setting to change port 16 on the router to DMZ mode. In the QoS menu you can configure the quality of service settings for the WAN connections and the LAN with the port-based, differentiated services code point (DSCP)-based or class of service (CoS)-based modes. 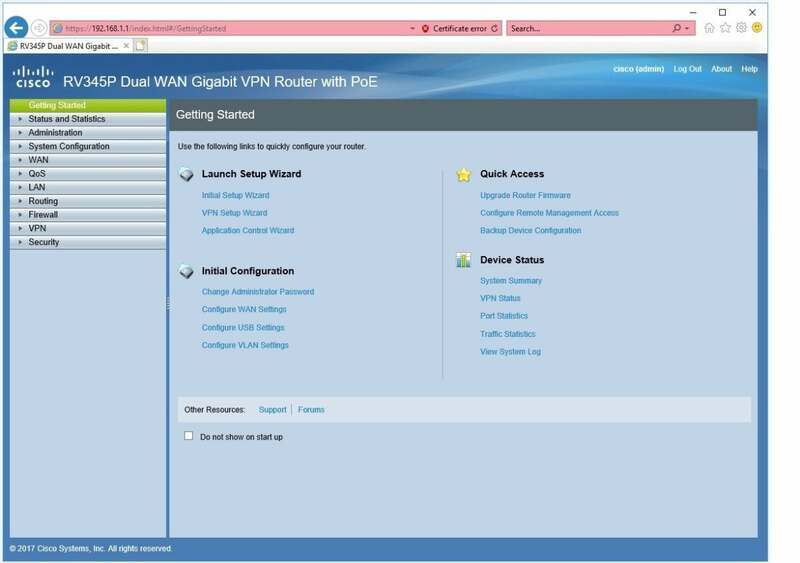 In the LAN menu you can configure the port, PoE, VLAN, DHCP and 802.1X settings. Unlike some of the other units we reviewed, this Cisco router does allow you to enable 802.1X authentication on the LAN ports. In the Routing menu, you can configure the IGMP proxy, RIP and static-routing settings. In the Firewall menu, you can configure the typical firewall settings, like remote access, access rules, NAT, port forwarding and triggering, and DMZ host. In the VPN menu, you can utilize a setup wizard for site-to-site connections. It has conveniently preconfigured IPsec profiles for the Amazon and Microsoft clouds. 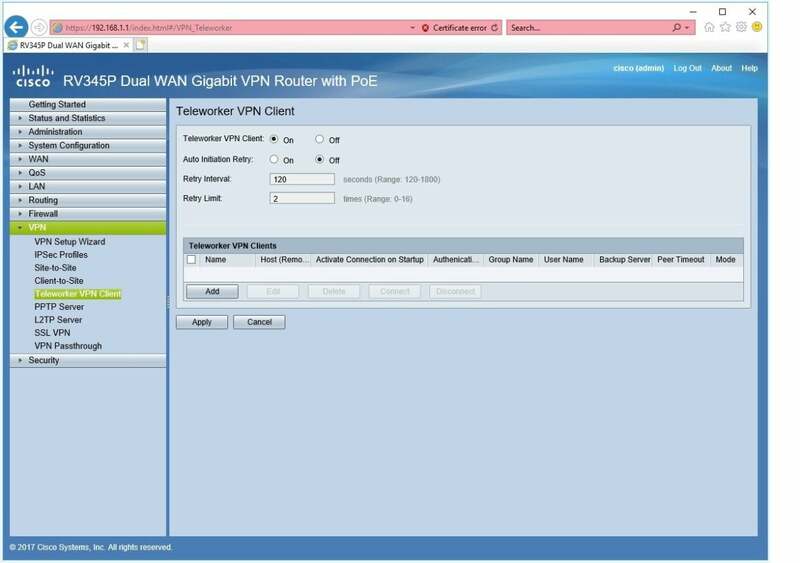 You can also configure the client-to-site connections, with support of Cisco’s Teleworker VPN client. There are also the PPTP, L2TP and SSL VPN servers you can utilize. In the last menu, Security, you can utilize their application-control wizard or manually create policies. You can also configure Web and content filtering and IP source guard features. Throughout our evaluation, we didn’t notice any tooltips or help shortcuts in the settings of the Web GUI. But there’s always a help shortcut on the top of the Web GUI. Clicking that link pops up their documentation for the particular settings you have up.